Naval Air Station Lemoore is the Navy’s largest, and only, west coast Master Jet Base, home to the Navy's F/A-18 strike fighter squadrons. 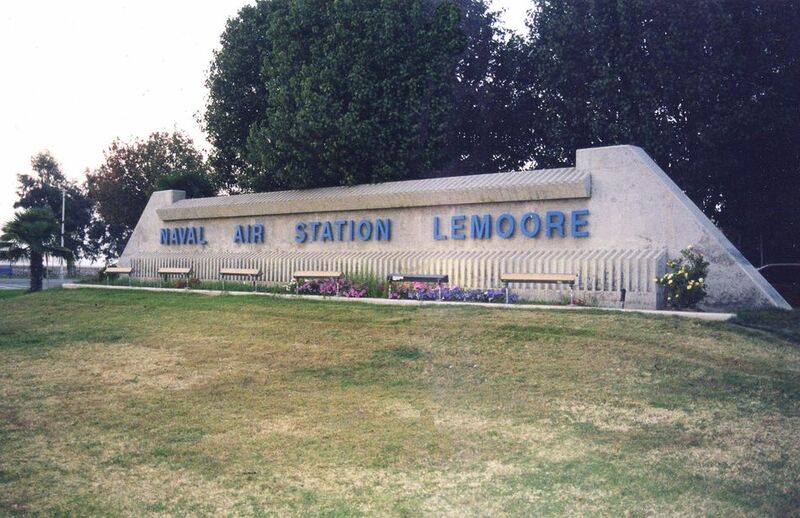 Naval Air Station Lemoore is located in California's Central Valley, chosen by the Navy for its central location, good weather for flying, relatively inexpensive land, and nearby accommodations. Located 40 miles south of Fresno, California, NAS Lemoore lies in San Joaquin Valley, the state's top agricultural-producing region. It was commissioned in 1961. The main gate is located on Highway 198, six miles west of Highway 41 and the city of Lemoore. This gate leads to all base support functions and base housing. The Naval Air Station is located on Highway 198, 19 miles east of Interstate 5 and 30 miles west of Highway 99. Both highways provide easy access to the air station. The closest commercial airport is located in Fresno. A NAS Lemoore military shuttle bus picks up military members on official orders from the Fresno airport seven days a week. The Pacific Strike Fighter Wing with its supporting facilities are homeported at Naval Air Station Lemoore. It's home to the Navy's F/A-18 strike fighter squadrons. Over 4,100 military families reside in the Lemoore area with approximately 40% of these families housed in government quarters. There are 1590 government homes located at NAS Lemoore. Of these homes, 1436 are enlisted units and 154 are officer units. There are over 193 applicants waiting for government quarters. Waiting times can be as little as 0-1 month, or as long as 8-12 months depending on rank and family size. The Navy has joined both Lincoln Property Services, Inc. and Clark Construction to improve and expand housing for service members and their families. Service members with eligible family members must check-in with the Housing Office located at 966 Franklin Avenue, within 30 days of arrival. This does not obligate you to move into base housing. Based on your needs, requirements, and eligibility entitlements, you will be placed on the appropriate waitlist or assisted in locating off station housing. Reagan Park hosts 40 FY68 units, 2 and 3 bedrooms, designated for E1-E4, located at the north end of Reagan Park. All are pet-friendly units (2 pets max, any mix or breed) with large fenced yards. These units are projected to be replaced during the 2008-2009 calendar year. Coral Sea, Constellation, Midway, Carl Vinson, Reagan, and Stone Parks all have single and two-story duplex style units with 2 to 4 bedrooms, small fenced yards, single attached garage, and some are ADA compliant units. All are pet-friendly. Stone Park hosts single and two-story duplex style 3 and 4 bedroom units designated for Enlisted E7-E9. All are pet-friendly. Reagan and Stone Parks have one and two story 3 and 4 bedroom homes designated for Officers. Styles are a mix of single family detached with an attached two-car garage and duplex with either single or double garages. All are pet-friendly. Service members checking into Bachelor Quarters must report to the Navy Gateway Inns and Suites located in Building 800. To check into a room you will need to present a copy of your orders to be eligible to receive a room. The facility is open 24 hours a day, 7 days a week. If you are reporting and wishing to receive a room while in a Geographical Bachelor status please call NAS Lemoore BEQ Manager at 559-998-0597 prior to reporting. Arrangements will be made to accommodate your needs as long as room exists. All single E-4 and below must reside within the Bachelor Quarters. All E-5 and above are eligible to live in the local commuting area. To request BAH, you must run a special request chit through your command and NAS Lemoore Commanding Officer. All barracks are completely furnished and centrally located to the Galley and NEX Q-Mart. There are scheduled bus runs to Operations side of the base with centrally located bus stops. NAS Lemoore utilizes unit integrity berthing allocations. There are no Department of Defense schools at NAS Lemoore. However, there are two schools located onboard the Naval Air Station serving children from kindergarten through eighth grade. Where you live on base determines which school your child will attend. High school age children are bused into Lemoore and attend Lemoore High School. It is a comprehensive high school whose curriculum offers an extensive variety of advanced placement, honors, and college prep courses as well as a broad choice of vocational education courses. There are many elementary schools throughout Kings County that offer a wide range of programs. In addition to the public school system, there are several private schools in the Hanford/Lemoore area. The Child Development Center offers full-time care for children ages 6 weeks to 5 years. The CDC is compromised of a main program center and two annexes with a capacity of approximately 300. Programs within the CDC are developmental in nature to meet the social, physical, emotional and cognitive needs of children. The CDC services are in high demand with a waiting list for full-time care spaces. The Child Development Homes Program is compromised of approximately 15 homes. Providers are an extension of the Child Development Center offering a variety of childcare services to meet the unique needs of the military schedule. The CDH office is located in the Child Development Center. Naval Hospital Lemoore is a state-of-the-art, 16 bed, community hospital located on the base. There's also an Immediate Care Clinic for after-hours treatment; Lemoore does not have an emergency room. Comprehensive dental care services are provided at an on-base clinic by active duty military members. Specialty care in oral surgery, periodontics, and prosthodontics is available. Headed for NAWS at China Lake? Here's What You Need to Know.